Traders are increasingly questioning their faith in the cryptocurrency world’s most important dollar peg. Tether, the digital coin used as a substitute for the U.S. currency on crypto markets around the world, has broken its historically tight link with the greenback. It recently traded for about 95 cents on U.S.-based exchange Kraken. Transactions on Binance, one of the world’s most active Tether venues, implied a price of about 96 cents, according to CoinMarketCap.com. While that’s a tiny move relative to other cryptocurrencies and not unprecedented for Tether, it’s triggering a fresh round of doubts over whether the so-called stablecoin is fully backed by dollars. Tether jitters prompted some traders to shift into other virtual currencies on Monday, fueling a rally in Bitcoin and shattering an unusually long stretch of calm in crypto markets over the past month. 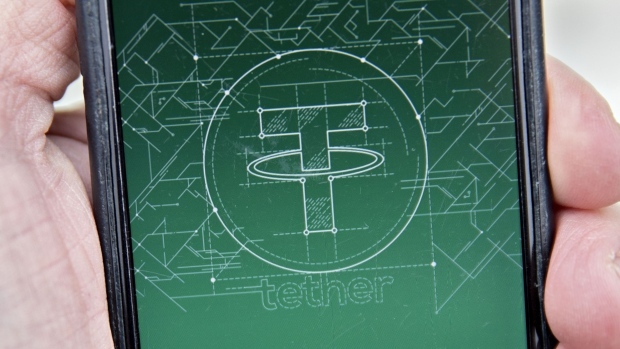 The company that issues Tether has yet to provide conclusive evidence of its dollar holdings, even though it has repeatedly said that all Tethers are redeemable at US$1. That claim helped make Tether the world’s second-most actively traded cryptocurrency: It was used in more than 20 per cent of transactions tracked by CoinMarketCap.com over the past 24 hours. Many crypto-related firms have struggled to retain banking relationships as regulators in the U.S. and elsewhere scrutinize the industry’s exposure to risks including money laundering, market manipulation and security breaches. The U.S. Commodity Futures Trading Commission sent subpoenas to Bitfinex and Tether at the end of last year, a person familiar with the matter told Bloomberg in January. Bitfinex couldn’t immediately be reached through an external spokeswoman. Bitcoin surged 5.2 per cent to $6,534.66 at 2:27 p.m. Hong Kong time, according to Bloomberg composite prices. Ether jumped 8.4 percent and Ripple added 7.1 per cent. The Bloomberg Galaxy Crypto Index climbed 6.4 per cent. Tether’s role as a dollar substitute has made it a huge part of the global crypto ecosystem. The digital coin is easily transferable between virtual currency exchanges and other online platforms because it doesn’t have to travel through the banking system. Stable prices have made it a handy instrument for betting on the direction of other cryptocurrencies, or as a place for traders to park their assets when they want to reduce exposure to market swings. Yet now that traders have several stablecoins to chose from, some may decide to dump Tether in favor of alternatives such as the Gemini dollar, a brainchild of Cameron and Tyler Winklevoss, said Jehan Chu, managing partner at blockchain investment and advisory company Kenetic Capital. Paxos Standard, another stablecoin linked to the dollar, was trading at $1.08 versus Tether on Binance.